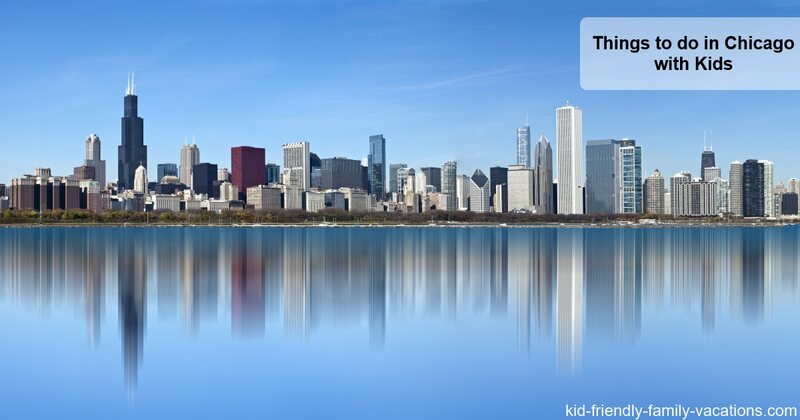 Chicago is a full rich experience including shopping, children’s museums, planetariums, and cultural events… There are just so many things to do in Chicago with kids! We have included Chicago into our family vacations two times. 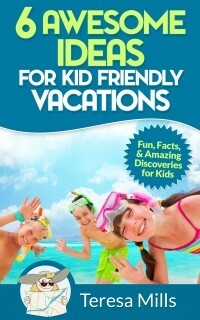 The first time was during a spring break when our oldest daughter was in Kindergarten. 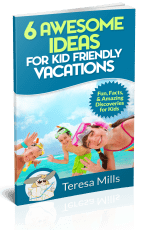 The second time was during a New Years vacation one year when our younger children were getting a little older. We visited Chicago via Amtrak train from Indianapolis on that trip – a fantastic way to get into the city! Let me preface this Chicago review by saying that because both of our first visits were during cold months, many of the wonderful outdoor activities that Chicago has to offer were not visited. 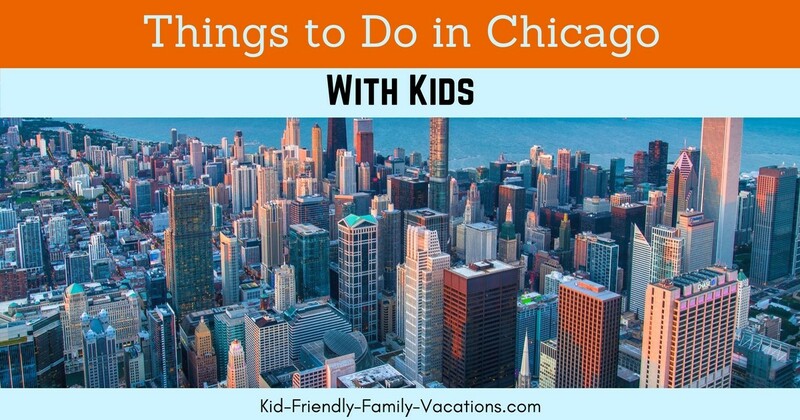 These include the Chicago Zoo and a Chicago Cubs baseball game. Even though the weather was cold during both visits, we found many indoor activities that the kids really enjoyed. 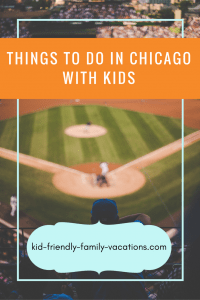 A third trip to Chicago by the men in my family included a Chicago Cubs baseball game and seeing some of the sights in the summer weather… so we are good to go for year round tips for a great Chicago Family Vacation! So…. 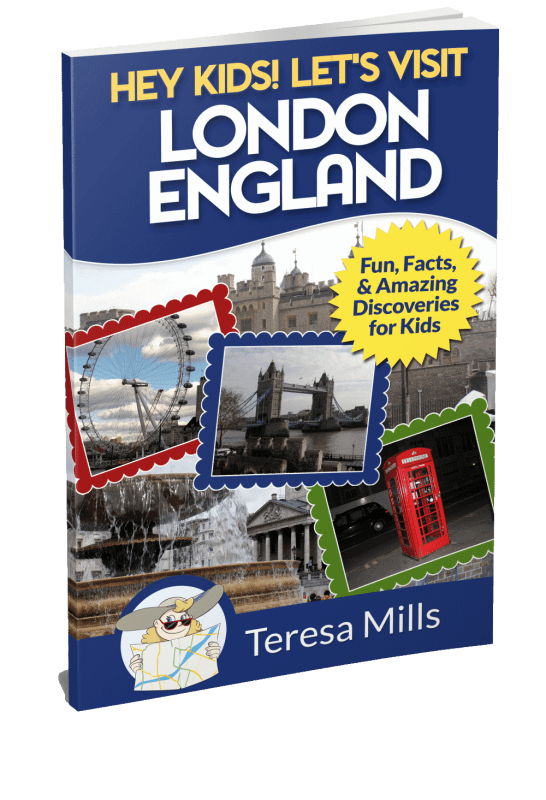 Here’s what you will find on this page…. We hope you will enjoy, and let this help you plan your things to do in Chicago! 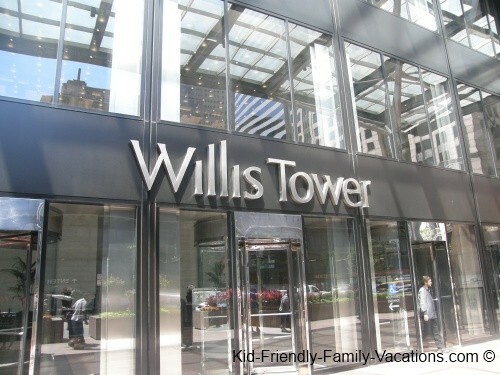 A must see destination with kids in Chicago is the Willis Tower Observation Deck. The Willis tower is now the tallest building in the United States after the collapse of the Word Trade Center on 9/11. The elevator to the top is unbelievably fast and your ears will pop on the way up. The full tower is shown in the photo above! The Hancock building is the second tallest building and the view from the observation deck is actually more spectacular than the Willis Tower because of the proximity of the building to the water front and Lake Shore Drive below. The kids enjoyed the view from the Hancock Observatory and Tower more than the Willis tower. 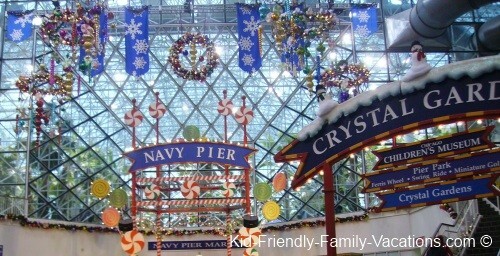 The kids also enjoyed a trip to the navy pier. This shopping and dining complex is located on Lake Michigan and most of the shopping area is actually over the water. There are a number of specialty shops and restaurants including Chicago Travel souvenir stores. A lot of the restaurants have outdoor seating, in the summer time and there is a huge Ferris wheel at the back of the dock. The girls really enjoyed all of the shopping opportunities along Lake Michigan Avenue. There a number of malls within an 8 block area. The favorite mall was Waterpower Place. This is a multilevel mall with 8 or 10 stores per floor. One neat thing that constantly amused the kids was that every business in Chicago has a revolving door. I spent a lot of time in Chicago getting kids out of revolving doors. 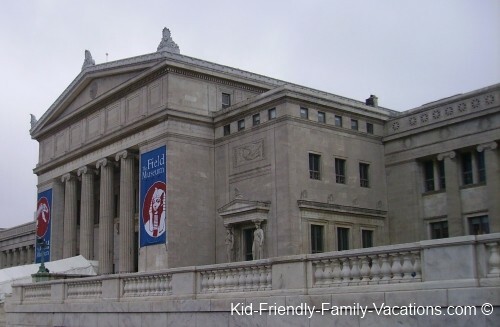 One of our trips out of the immediate downtown area was to the Field Museum south of Downtown adjacent to Soldier Field (Home of the Bears) This is a very good museum with the quality of exhibits as good as or better than the Smithsonian. One of the best parts of the museum is a huge collection of stuffed animals from all over the world. The animals are placed in natural type environments and the collection is extensive. There area also many cultural exhibits throughout the museum. The Grand Hall as you enter the museum is featured in a recent movie….. Night at the Museum. 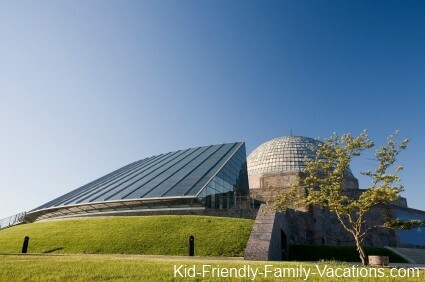 The Adler planetarium is located next to the Field Museum. You can also sample Chicago Deep dish pizza at a really good Italian restaurant that is only a couple of blocks from the Willis Tower. 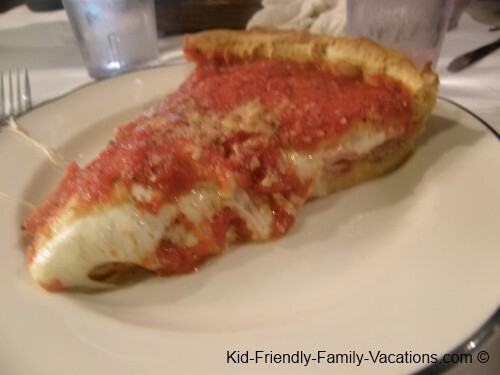 Giordanos has several locations in the downtown Chicago area. The atmosphere is very simple but the pizza was as good as advertised and very filling. Our last meal was at a Weber Grill Restaurant that we just happened across. This food was really good and reasonably priced. Our next visit to Chicago will be in the Summer or Fall so we can enjoy some of the great outdoor opportunities. 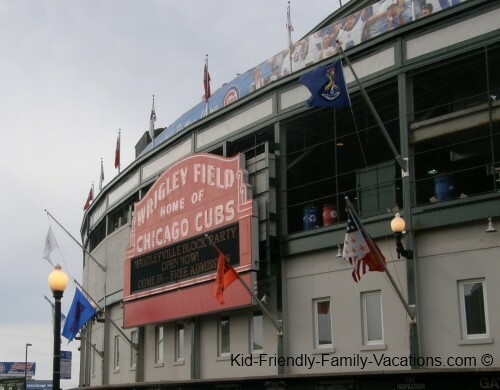 A super kid friendly thing to do in Chicago is to take in a baseball game at Wrigley Field. The prices are reasonable and the atmosphere is fantastic! Parking in Chicago is at a premium, and is very costly…. our recommendation is to not drive into the city. We have traveled into Chicago several times by train, and that is definitely the way to go if you are not flying! A train into Chicago will deliver you directly to Union Station – where you will then be able to take a taxi or public transportation. We used public transportation several times in Chicago including the “ L” and buses. We found the trains to be very safe during the day, but I have been told that nightime Chicago travel with kids may not be a good idea. One of our favorite stays was at the Homewood Suites downtown. This was a very nice location with a full buffet breakfast included in the stay. There was also a big indoor pool and exercise room on one of the upper floors. One interesting thing about this location was the hotel layout. You entered the hotel from street level with a door man on duty. The hotel lobby was on the 6th floor, but floors 2 thru 5 were not part of the Hotel but part of an office building on the next street over. This was a really nice hotel. Because we came into Chicago via Amtrak, we did not have to pay for parking, but it can be pretty expensive. As we have mentioned on multiple posts on this site…. 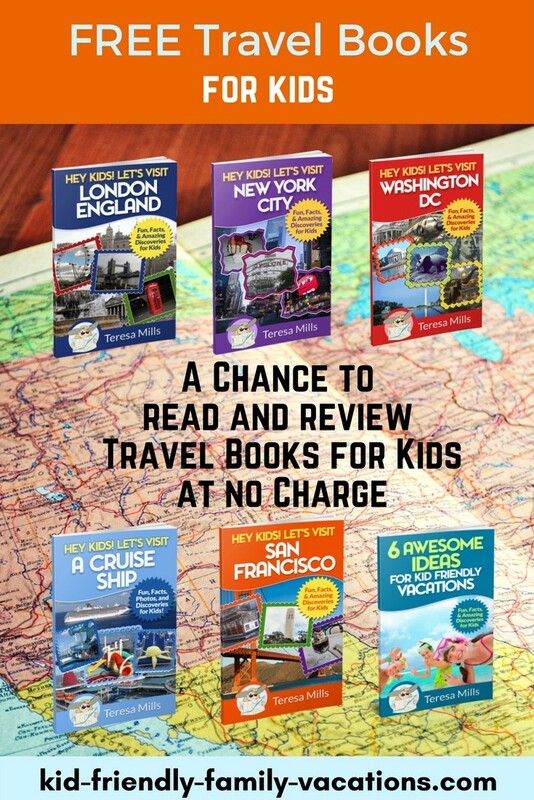 if you are traveling, and making reservations as you travel, take advantage of Hotwire.com to find the best prices for rooms…. this, of course holds true for making travel arrangements before the fact as well. Enjoy this list of all Things to do in Chicago ranked by popularity of visitor reviews.